Images of war protests on TV, sounds of protest songs led the Billboard chart. But to spunky “Irish” as she was known, her love of country and dedication to service led her to enlist in the United States Army. Born in Methuen, MA, raised in neighboring Lawrence in a family of 12 children, four brothers and seven sisters, Irish said she had a simple choice based on her family’s makeup: “politics or military” to follow the steps of those family members who came before her. Irish was commissioned as a 2nd Lieutenant in the U.S. Army, and began Boot-camp training at Ft. McClellan in Alabama. Fort McClellan was home of the Women’s Army Corps School, and the U.S. Army’s Chemical Center and School. In addition to the Chemical School, Fort McClellan hosted the U.S. Army’s Combat Developments Command, Chemical Biological-Radiological Agency . It was here, she claims, that her life took an unexpected and unwarranted turn. Unfortunately for Irish, she says, “training exercises involved exposure to various gases which we were told were ‘not in a quantity to inflict permanent harm.’ We thought it was tear gas,” she said. Following an extreme skin reaction after exposure, Irish says she began a downward spiral of medical problems. She was later transferred to Camp Richie in Maryland and from there received her diagnosis at Walter Reed Medical Hospital in D.C. Having shrunken from 125 pounds to just 96 pounds, she began a long road back to stability. After her apparent recovery, she applied and was accepted as an operations officer, and then applied and was assigned to a battalion in southern Germany in the signal corps. Women were not allowed in combat in leadership positions at the time. It was during her trip to Germany that she was notified of the cessation of action in Vietnam. She continued to serve, earned medals of commendation and was promoted to Captain. Her service also included the National Defense Service Medal. She was discharged in 1977. Later, under the Vietnam Readjustment Act, she was hired at the IRS in Andover where she worked until 2005. In 2005, complications of her earlier chemical exposure led to a downward spiral of medical problems and she was terminated. “I needed that job, a reason to get out of bed, and a steady routine. I need the structure,” she explained. Today, at age 57, looking back at her time in the military, she proudly displays her medals and speaks with high regard for her fellow veterans. But she remains frustrated and saddened at not being able to help others as much as she would like to help them: to spread the word and let her fellow veterans know that they are not alone. “I was able to do well. But the dioxins in my body, they don’t go away, and they slowly eat away at you. I was young. I’m still young, but I’m dying. Little by little, for 37 years I’ve been dying,” she said. Now, Capt. 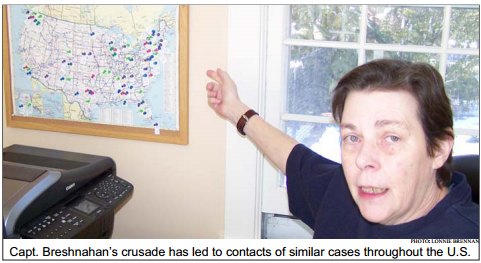 Bresnahan sits beside a map of the United States scattered with pins to show the locations of fellow veterans who she has been in contact with who, she said, have experienced state-side Agent Orange exposure. “It’s something I have been outspoken about” said the now vocal activist and advocate for medical support for her fellow veterans. “They would throw canisters, they would spray from above. They would spray. They would simulate war exposure,” she said. “How many thousands of us are there?” she asked. Since her downward spiral accelerated a few years ago, Capt. Bresnahan says that she has made it “my crusade to try to contact every single person I knew in the military to inform them that if they were sick too, to see my example,” she said. She said she has gone to Washington, D.C. three times to provide testimony regarding state-side chemical exposure. Capt. Bresnahan is a member of the Vietnam Veterans of America, the Disabled Veterans of America, and the American Legion amongst other veteran’s organizations. Initially denied VA medical benefits because her service records did not show service in Vietnam, she appealed and won. She relates cases where others have been denied entitlements, medical care, and compensation and are still struggling to get the care they need. “We don’t have time. We are running out of time,” She said. “There is no cure, no treatment. It just keeps coming. We are dying…we don’t know how many of us there are. “Agent Orange doesn’t care where you were exposed. It’s an equal opportunity poison. You could be here or in Vietnam or anywhere,” she said. “Here’s my heart break. How old do I look?” she queried. “It’s caught up with me and it’s killing me…I gave me life to my country,” she said. Is there such a thing as a typical Vietnam-era solider? Capt. Breshnanan thinks that every soldier, no matter where or how they served, served their country and she is proud of them. We at the Valley Patriot are equally as proud of our veteran heroes and think our country should do everything possible to help them deal with the aftermath of their service.